With the release of PHP 7, not only did the new version offer increased security over PHP 5.6 there was one other significant improvment, speed. 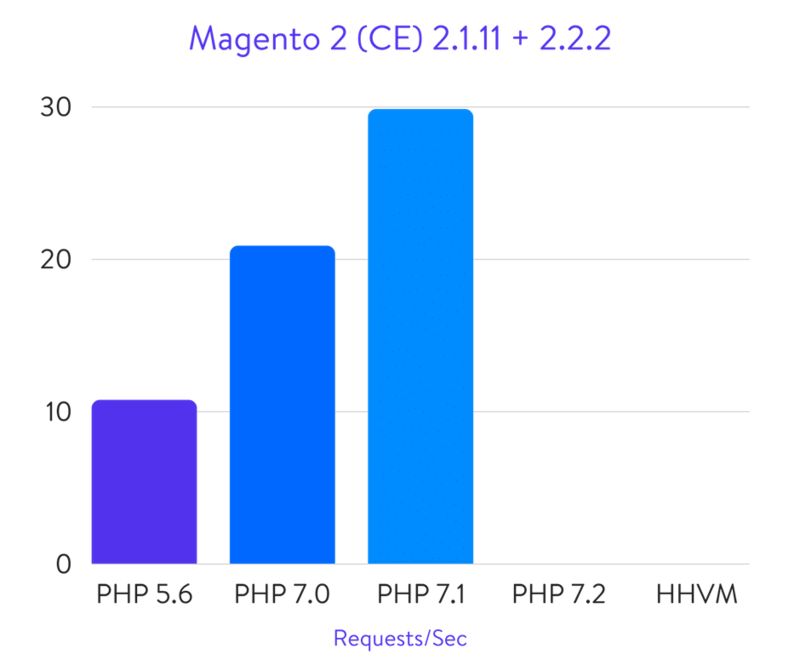 The release of PHP 7 was a very impressive one resulting in various tests an improvement factor of nearly double the performance of PHP 5.6 in Magento. PHP 7.1 although not doubling performance again, does offer yet another remarkable increase. In the example below Kinsta used free Luma theme, Magento 2.1.11 to run PHP 5.6* and Magento 2.2.2 running PHP 7.0 and 7.1. The graph clearly shows the impressive gains to be had from migrating to the newer versions of PHP. PHP 5.6 benchmarked at 10.75 requests per second but PHP 7.0 scored 20.87 requests per second. That is very nearly double the performance from simply updating to the newer version. PHP 7.1 did not manage to double the performance again at 29.84 requests per second but it does represent nearly three times the performance of PHP 5.6 while nearly a third more than PHP 7.0. Again a very impressive and consistent performance gain throughout the various iterations. For all our customers Migrating your PHP couldn't be easier, simply raise a ticket and we will do all the work for you.